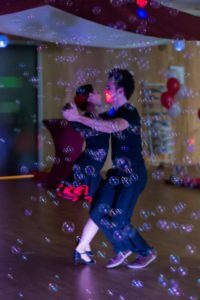 Argentine Tango is a particularly elegant partner dance that originated in the 1880’s along the River Plata, the natural border between Argentina and Uruguay, and soon spread to the rest of the world. It is typically danced in a tightly closed position in which both dance partners move as one. The tango is an essential part of Argentine and Uruguayan culture. As of August 31, 2009, UNESCO even admitted the tango into the UNESCO Intangible Cultural Heritage Lists!